I was told on the day I boarded for my first cruise voyage that it would be something I would never forget and that the ship would also hold a place in my heart forever, I laughed and smiled thinking “ok this lady is crazy, it’s a ship”, but I soon realised every word she said was true. My first cruise was on board P&O Cruises Oriana back in 2007 and I still remember now the feeling I got when I first set eyes upon her. It was the first time I had seen a cruise ship and I couldn’t quite get over just how massive this thing was. She was sitting at Southampton port waiting for her passengers like Lady of the manor and I instantly fell in love. We had picked a 12-night Canaries cruise, opting for the 12-nights just in case half way through I decided no, cruising is definitely not for me (I had to be convinced to go in the first place, one because I was convinced I would spend the entire time feeling ill but also that I just wouldn’t enjoy it or feel comfortable) but from the moment I stepped on board I was star struck, that really is the only way I can describe it. Although in comparison to some, Oriana really is not a massive ship to me she was huge and I had never seen anything like it. The closest I had come to seeing anything that even slightly resembled a cruise ship was the DFDS Ferry and even that was a long way off what I was seeing at that moment in time. 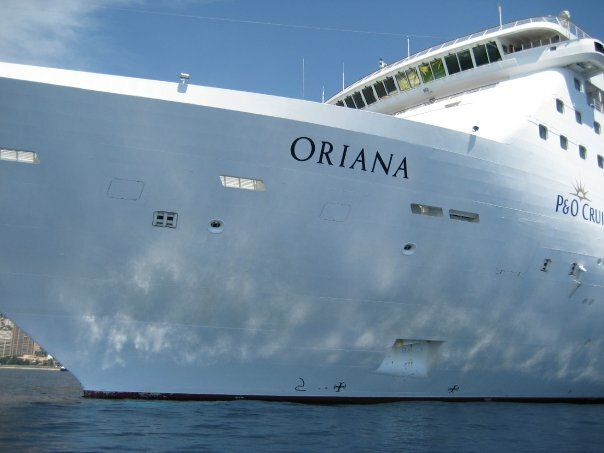 Oriana was amazing, she had numerous bars and dining venues, swimming pools, whirlpool spa’s, at the time kids clubs (she is now adult-only) more than enough deck space and she had such a great atmosphere. Obviously that is the norm for cruise ship’s but being completely unaware really of what to expect I was quite impressed. Of an evening we dined on a table of 8 and on formal evenings had the pleasure of dining with the loyalty manager on board. It was such a great laugh, our table was quite a young bunch and we got on literally got on like a house on fire. Even now when I talk about my first cruise to others they say how lucky I was to have such a great table of people, we all know it can be hit or miss but on that particular cruise we hit the bullseye! The lady on Oriana told me on day one “your first cruise ship stays with you forever” and it really does. It is so strange, every time since that I have caught a glimpse of her I have given the typical “ahhhhhh” the type of sigh and emotion people give to an adorable little puppy, I give to Oriana. To be honest I still don’t think I “get it” entirely but I can’t stop myself from doing it. I will forever have a soft spot for Oriana, I guess I understand why people were a little saddened when P&O sold Artemis, if it had been Oriana I too would have mourned my loss. I couldn’t have picked a better ship. I would love to step back on board one day and relive that first cruise feeling again…….one day. Our first cruise was on MSC Sinfonia, which perhaps hasn’t ‘stayed with us’ quite as much as your first cruise, on Oriana, did with you! Nonetheless it was good enough to get us hooked on cruising. 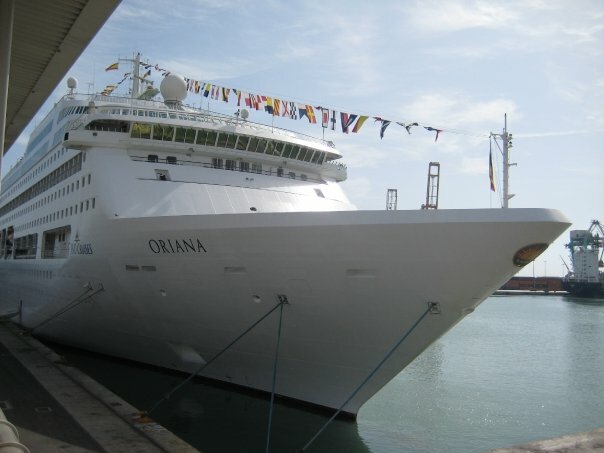 We’ve been on Oriana, in 2008 I think, and we’ll be back on her for the Grand Event cruise. It will be interesting to go back to an older ship with the smaller cabins – we’ve got very used to balcony cabins on Ventura. So true. My first cruise was on Ocean Breeze, a half-size old ship belonging to a one-ship line no longer in business. The ship has since hit the scrap heap. It made me sad to hear that. Even though that ship had none of the amenities regular cruise ships have and my room under the stage resembled a hallway more than a cabin, that short 3 day cruise gave me the love of cruising forever and a strong desire for a trip on a “real” cruise ship. After the several years it took to talk my husband into going, now he’s as big a cruise fan as I am. I totally agree!! Cruising becomes a love affair, an obsession!! My husband & I, sometimes along with other family members, have been cruising twice a year for the last few years. The only problem I have found is that I look forward to each cruise so much that I want the months to fly by, thereby not enjoying each day as it comes. That really isn’t such a problem as long as there is always another cruise coming up! I would love to be able to afford going from one cruise to another, get off one & get on the next. I might get tired of that after a year or two, but not quite sure!